Relax and just stare into the infinite landscape from Ponta da Piedade, in Lagos, Algarve. 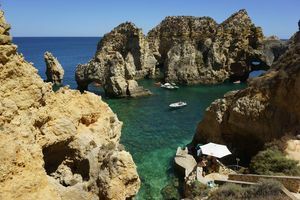 Ponta da Piedade is an spectacular natural monument three kilometers south of Lagos, in a relaxed and quiet area battered by the wind. Even the landscape alone is worth seeing for its impressive cliffs and rocky formations, modelled with eerie shapes by the ocean and topped with a lighthouse. In the middle of this beautiful landscape, the reddish tone of the rock contrasts with the clean green of the waters, leaving a permanent imprint on the visitor. During the clear days, you can even see the town of Sagres towards the West. If you follow the small road towards the left side of the lighthouse, you will reach a small spot with amazing views over the rocks and Praia de Donha Ana beach.